This year a new special award will be up for grabs in the International Youth Concert and Competition. The Kelwood Cup for the most entertaining youth performance will be adjudicated by Cornwall's prolific composer and conductor, Russell Pascoe, and this has all been made possible due to the kind donation of the trophy by Harry and Margaret Woodhouse. The Kelwood Cup is named so due to Margaret's maiden name being Kelynack and as previously mentioned Harry's surname is Woodhouse, join the 2 together = Kelwood! Gareth Churcher, Festival Artistic Director, said "It is great to have this additional award on offer this year to the boys choirs. The opportunity to acknowledge a really entertaining performance adds another level of enjoyment for all involved in this very special event and my sincerest thanks go to Harry and Margaret for their kind donation". The Youth International Gala Concert and Competition is being held as part of the 2019 CIMCF and takes place at Truro Cathedral on Sunday the 5th of May from 12:30pm. Please come along and support this and as many of the other events that are happening across Cornwall from the 2nd to the 6th of May. A concert of three outstanding choirs in Falmouth on February 23rd will give a taste of the musical treats to come when the Cornwall International Male Choral Festival bursts across the Cornish scene from the 2nd to 6th of May. At a presentation ceremony on 20 October the 2018 winners of the Composers Competition were announced. World class composers descended on Cornwall from Seattle, Shanghai and Surrey to claim their prizes in the hotly contested Composers’ Competition - a jewel in the crown of Cornwall’s biennial International Male Choral Festival. Kari Cruver Medina from the USA, Norwegian Jens Peter Jongepier who lives and works in China and Ian Assersohn from Epsom in Surrey arrived at Truro College where the awards’ ceremony and premiere performances of their compositions were live-streamed to world-wide audiences. All three composers were overwhelmed by the rendition of their music by the Truro School Barbershop Boys and choral scholars from Truro Cathedral, conducted by CIMCF Artistic Director Gareth Churcher. The winning pieces will also be performed at next year’s Festival – the largest event of its kind in the world - which runs from the 2nd to 6th of May 2019. More than 60 choirs from across the globe will gather for more than 50 concerts and events in 40 venues right across Cornwall. The quality and quantity of the entries created tough decisions for competition adjudicator Alan Bullard – but finally Kari Medina’s complex and powerful setting of the Robert Burns poem Winter Has Come won her the top prize of £1000 along with the Harold and Thelma Miller Trophy. Alan says Kari’s winning composition, “communicates well the stormy winter and the rising of the spring with punchy rhythms and metre changes…This piece brings something different and liberating to the male voice choir world and a confident performance will be exciting for both performers and audiences alike." Kari is a Seattle-based composer and pianist whose work spans a broad range of stylistic traditions and whose music has been featured across the United States and abroad, with choral and orchestral works premiered recently in both Europe and Asia. On winning the international Competition she says, “This has been such an opportunity for me – to come to this beautiful county of Cornwall with its incredible Male Voice Choral tradition and to hear the boys singing my work is amazing. Ian Assersohn, a composer, arranger and choral director who won the Competition in 2014, came away with top prize of £1000 in the Cambiata category with his composition for young male voices, Slow Down. He also took third prize in the main competition with When I Set Out For Lyonesse, pipped for second place by composer, musician and music teacher Jens Jongpier’s composition The Blue of Distance. 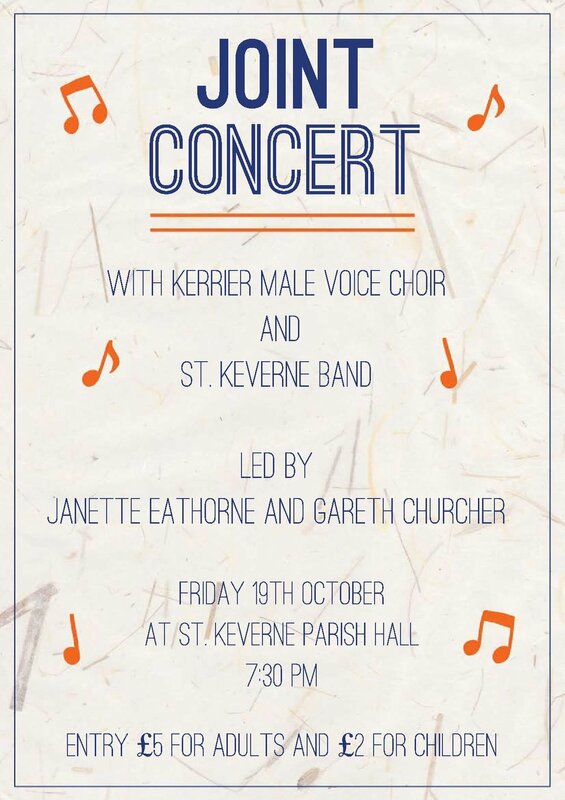 A joint concert is being held on 19 October 2018 at St Keverne Parish Hall. Led by Janette Eathorne and Gareth Churcher. The Cornish-American Song Institute from Texas, friends of CIMCF, are performing A Song and Choral Festival at the Church of King Charles the Martyr in Falmouth. On 19th, 20th, and 21st June they're presenting different and varied choral programmes. If you are nearby or can get to Falmouth on any of these days you'll enjoy some sublime and inspirational music. Gareth Churcher and the Directors of the Cornwall International Male Choir Festival would like to congratulate Rame Peninsula Male Voice Choir and its offshoot Halfway Harmony who have been awarded the QUEEN'S AWARD FOR VOLUNTARY SERVICE. Rame Peninsular MVC perfectly represents the spirit of the whole community of Cornish Male Voice Choirs in their charitable work, and we're proud to be associated with them. “This is the UK's highest accolade for voluntary groups and we are the first men’s choir in Britain to receive this award. George Leggo has been a member of Treverva Male choir for 50 years this year, and for 12 years was a member of Eight in a Bar. When very unwell recently he greatly benefitted from care received at Marie Therese House in Hayle. To express his gratitude a benefit concert has been arranged for Saturday 4th August at 7.30pm at Penryn Methodist Chapel, to include Treverva Male Choir, Eight in a Bar and Mabe Ladies. The compere will be George's son Colin who you may have seen or heard of as a stand-up comedian. Please try and support this great cause, and have a great night out at the same time. 2018 has seen the highest number of entries ever for this competition. With prize money totalling £2750 together with international prestige and publicity, it has attracted Composers from across the world. Entries have come from countries including China, Taiwan, Russia, Brazil, North America, Oceania, and throughout Europe and the British Isles. The final entry date was 31 March 2018 and entries are now being passed to the adjudicator Dr Alan Bullard. Four internationally renowned and distinguished experts have now been appointed to adjudicate the 2019 Male Choir Festival and the 2018 Composers Competition. Dr Alan Bullard, composer, author and teacher, will adjudicate entries to the Composers Competition. For the International Male Choir Festival competition we are thrilled to announce adjudication by King's Singer Timothy Wayne-Wright, Director of the Canadian National Boys Choir Dr Jakub Martinec, and Truro Cathedral Director of Music Christopher Gray. Gareth Churcher, Artistic Director of the Cornwall International Male Choral Festival, is interviewed on BBC Radio Cornwall 26 February 2018. Gareth describes the history and current status of the Festival, and his feelings on being asked to become Artistic Director. Globally-acclaimed music maestro Gareth Churcher has been announced as the new Artistic Director to lead Cornwall’s hugely successful International Male Voice Choral Festival (CIMCF) – the largest event of its kind in the world - to its next event in 2019. Gareth takes over from another award-winning Director, Rob Elliott, whose 2017 event saw 2000 singers from 60 choirs of all ages and nationalities - including Australia, the USA and Russia – taking part in 50 events in 40 venues right across Cornwall and bringing around £1million into the local economy. Gareth’s commitment to promoting music across Cornwall and beyond is legendary and was recognised by his being anointed a Cornish Bard as a "True Ambassador for Music" as well as being awarded the Trelawny Plate for outstanding services to Cornwall. He has worked tirelessly and creatively to ensure the future of music teaching for Cornwall’s young people – devising a new model Cornwall Music Service Trust when budget cuts saw the demise of Cornwall Council’s own service. The not-for-profit Trust, of which Gareth is founding Head of Service, now employs 120 Music Teachers & Music Therapists and delivers over 1000 hours of music education per week to students in schools and other educational establishments across the length and breadth of Cornwall. He is Director of Music for many ensembles, both community and education sector-based, including, with great success, the St Keverne Bands, Eight in a Bar Choir and the Truro School Barbershop Choir – the latter two of which both won classes at the 2017 CIMCF. Those other commitments include studying for a PhD at Falmouth University in an innovative project which involves composing music specifically for Online Ensembles, as well as holding a publishing contract with Kirklees for musical composition with works performed internationally. Alongside being supported by an established Festival committee and patrons, more than 300 dedicated volunteers, the choirs themselves and a wide range of local businesses, Gareth will benefit from the assistance of experienced music manager Jenny Keymer, who has been appointed Festival Administrator. Gareth’s work with young people will provide an added emphasis for the Festival into the future: “I’m very excited to be building on the exemplary work of previous Festival Directors,” he says, “and I aim to keep the very high international profile of the CIMCF, attracting even more top choirs including youth choirs. Gareth and the team are hard at work ahead of the ninth biennial Cornwall International Male Choral Festival – with choirs from across the world already signed up for the event which will run from May 2nd to May 6th 2019. The eight Festivals since its inauguration in 2003 have brought around 16,000 singers from every continent on Earth (including Cornwall) for a celebration of music and song in the male choral tradition. A founding father of Cornwall’s International Male Choral Festival – now the largest event of its kind in the world - has been made a Member of the Order of the British Empire (MBE) in the 2018 New Year’s Honours list. John Larke, who was instrumental in setting up and developing the world-renowned Festival, and who has been part of the key team of organisers working tirelessly on it for almost eighteen years, has been awarded the MBE for his services to music in Cornwall. John – who has also sung with the City of Truro Male Voice Choir for the past thirty years and been its chairman for the last fifteen – is eager to stress he is one of a huge number of people who devote their time and energy to celebrating the male choral tradition and ensuring the Festival is such a popular and joy-filled event. John and the team are already hard at work ahead of the ninth biennial Cornwall International Male Choral Festival – with choirs from across the world already signed up for the event in Spring 2019. The eight events since the Festival’s inauguration in 2003 have brought around 16,000 singers from every continent on Earth (including Cornwall) for a celebration of music and song in the male choral tradition. During the 2017 event 60 choirs and their entourages – from as far afield as Australia, the USA and Russia – took part in 50 events in 40 venues right across Cornwall with organisers estimating that the four day Festival brought around £1million into the local economy.